Prefabrication and innovative transporter technology reduced the impact of construction congestion on motorists from months to days when the Utah Department of Transportation replaced a bridge over Interstate 215 in Salt Lake City. Funding from the Federal Highway Administration's Highways for LIFE program helped the Utah DOT use innovations on the $6.6 million bridge project to reduce construction congestion and build a smoother, quieter, longer-lasting bridge. The new bridge replaced a deteriorating structure built in 1971. The new superstructure was constructed offsite and the new substructure was built under the existing bridge while it remained in service. Once the new substructure was complete, the existing structure was removed and the new superstructure was moved into place with self-propelled modular transporters. Using normal construction techniques on the bridge project would have affected traffic flow on I-215 and State Route 266 for up to nine months. Using accelerated bridge construction techniques such as prefabrication cut construction time to five months and traffic impact to just two weeks. For motorists using the bridge, the impact included a two-week closure while crews removed the existing structure, set the new structure in place and prepared the bridge for traffic. For interstate traffic, the impact was even less. Traffic lanes under the bridge remained open while the new substructure was constructed next to the interstate. The interstate was closed to traffic from 6 p.m. Friday to 6 a.m. Monday in late October 2007 for removal and replacement of the bridge structure. The new bridge was ready for traffic by Monday morning rush hour. Crews used SPMTs to move the superstructure from the construction site to its final location over the interstate. In addition to reducing traffic disruption, prefabrication offers benefits such as greater work zone safety and less impact on the environment. Also, prefabricated bridge elements are made in a controlled environment, which enhances the quality of the bridge and results in a longer-lasting product. This project was the first time the Utah DOT used self-propelled modular transporters, computer-controlled platform vehicles that can move a heavy load such as a bridge system from an offsite location and lift it into place with great precision. The process of moving the bridge structures with SPMTs went smoothly, according to Russ Robertson, bridge engineer in FHWA's Utah Division. It took about nine hours on Saturday to remove the old structure and seven hours on Sunday to move the new structure into place. The greatest challenge during the move involved geometry, Robertson said. The new overpass is on a 12 percent slope, while the roadway on which the bridge structures were transported is on a 4 percent slope with a 2 percent cross slope. In addition, the elevation difference between the north- and southbound lanes of the interstate is five feet (1.5 meters), and the new structure needed to be within four inches (10 centimeters) of its final placement at all times. The new 172-foot-long (52.4-meter-long) superstructure, built in the gore zone of an existing ramp, was transported only about 400 feet (122 meters). But the process involved moving it onto the interstate, turning it 90 degrees, and dealing with the elevation difference between the lanes. It cost an additional $800,000 to prefabricate the bridge and move it into place with SPMTs, according to the Utah DOT, but using these innovative construction methods instead of traditional ones saved the public an estimated $4 million on commuter delays and gasoline consumption. About 20 out-of-state transportation professionals and hundreds of local residents turned out to observe the weekend bridge move. The Utah DOT plans to use prefabrication and SPMT technology for similar bridge replacements in the coming years. For more information on the project, contact Russ Robertson at (801) 963-0182 or russell.robertson@dot.gov. To learn more about bridge prefabrication, go to www.fhwa.dot.gov/bridge/prefab. Innovative contracting methods, extra safety measures and careful construction sequencing will speed the work and make it safer for drivers and workers alike on a $50 million highway reconstruction project in Arizona. The project, known as State Route 179 Project 2, is located on one of three main access routes to Sedona, Ariz. SR-179 passes through one of the world's most unique scenic areas, renowned for its red rock outcroppings and a draw for upwards of 4 million tourists a year. Construction is scheduled to start in late 2007 on Project 2, a 3.5-mile (5.6-kilometer) project to widen SR-179, now a two-lane highway with dirt shoulders. Project 1, which includes the 6 miles (9.6 kilometers) south of this project, is already under way. Reconstruction on Project 2 will widen the road to a two-lane divided, multimodal highway with 8-foot (2.4-meter) shoulders for bicycle lanes, pedestrian pathways, transit stops, a raised median, and several right- and left-turn lanes. Six roundabouts will be built at the major intersections. Two-lane traffic is maintained, and so is access to homes and businesses in this section of SR-179 being reconstructed adjacent to the Highways for LIFE section. The project also includes the replacement of a two-lane bridge across Oak Creek with a wider structure that will accommodate part of a roundabout, the bike lanes and a pedestrian observation deck, and a separate utility-pedestrian bridge alongside the highway. For the innovative and safe construction methods used on the project, the Arizona Department of Transportation has won a $1 million grant from the Federal Highway Administration's Highways for LIFE program, said Karen King, transportation safety engineer for FHWA's Arizona Division. 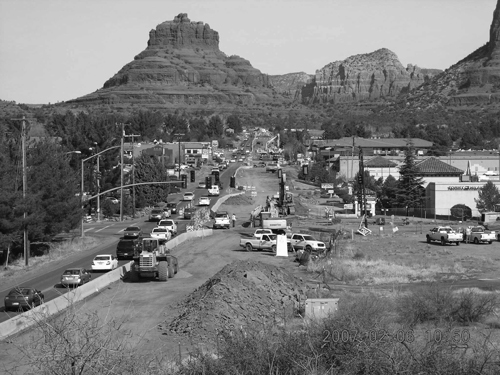 About one-half mile (0.8 kilometer) of the project passes through the Sedona business district, said Carl Burkhalter, project manager for the Arizona DOT. To minimize disruption to businesses, the state has offered the contractor an incentive of $5,000 a day to substantially complete the business district section earlier than the scheduled date. But if the contractor finishes that section late, the state will levy a $5,000-a-day fine. On-time completion will result in no incentive or penalty. The state is also using the innovative lane rental concept, which gives the contractor an incentive to keep traffic lanes open as much as possible during construction. Temporary lanes have been constructed alongside the existing road and, for the most part, two lanes will be open throughout the two-year construction time. With the lane rental concept on SR-179, the state reserves $400,000 and the contractor draws against that amount to rent a lane that must be closed. It costs the least to rent (close) a lane on weekdays during off-peak hours, and more during busy daytime hours. Lanes cannot be closed on weekends. A t the end of the project, whatever money remains unspent for lane rentals is the contractor's bonus to keep. The contractor on Project 1 had spent about $30,000 of a $200,000 lane rental fund by the time the project was more than 60 percent complete. “The lane rental concept has worked great on Project 1 in encouraging the contractor not to close lanes,” said Burkhalter. A pilot program will train local law enforcement officers on enforcing the laws in and around the construction work zone. Additional local law enforcement officers will be hired to maintain a substantial visual presence in the work zone area. Occupational Safety and Health Administration construction safety training will be provided for the Arizona DOT's resident engineer, project manager and safety inspector. It will be the first time the agency has expanded OSHA training beyond the safety and health program manager and a few safety employees. The new Oak Creek bridge will be built with precast, prestressed concrete box girders. Bridge construction is expected to take just nine months, three months less than it would take to build a cast-in-place bridge. The bridge will be built in phases to maintain two-way traffic. Plus, said Burkhalter, the use of precast girders will result in substantially less environmental impact on Oak Creek than would the use of falsework to build a cast-in-place bridge. For more information, contact Karen King at (602) 382-8965 or karen.king@dot.gov. Self-propelled modular transporters, vehicles that can remove existing bridges and install new ones, are helping states like Utah complete bridge reconstruction projects with minimal traffic disruption. SPMTs are computer-controlled, multi-axle platform vehicles that can move prefabricated bridge spans weighing several thousand tons and position them accurately within a fraction of an inch. With SPMTs, bridge construction that in the past shut down traffic for months can now be completed with road closures of just a few hours. The use of SPMTs for bridge moves was the top recommendation of the 2004 international scan on prefabricated bridge elements and systems sponsored by the Federal Highway Administration, American Association of State Highway and Transportation Officials and National Cooperative Highway Research Program. The scan team learned that European countries frequently use SPMTs to move prefabricated bridge components to their final location in just minutes, minimizing traffic disruption, improving work zone safety and enhancing the quality of the completed bridge. As a result, the team recommended that U.S. states consider SPMTs for bridge projects in which reduced onsite construction time is a priority. In addition to the Utah Highways for LIFE project, SPMTs have been used on U.S. bridge projects in downtown Chicago, over the Columbia River between Washington and Oregon, and in Florida, Louisiana and Rhode Island. FHWA recently published the Manual on Use of Self-Propelled Modular Transporters to Remove and Replace Bridges (FHWA-HIF-07-022), which provides details from project conception to completion for using SPMTs to remove or install a bridge. The manual, available at www.fhwa.dot.gov/bridge/prefab, describes equipment, lists benefits and costs, and identifies criteria to determine when this technology is appropriate. It covers planning, design and contracting issues and includes sample calculations, diagrams, specifications and case studies. Road safety audits-used for years in Australia and New Zealand-are emerging in the United States as a proactive tool to maximize the safety of roadway designs and operations and reduce highway deaths and injuries. A road safety audit is an examination of the safety performance of a roadway or intersection by an independent, multidisciplinary team. It can be done while a project is in the planning stages or to identify safety issues on an existing roadway. RSAs help produce designs that may reduce the number and severity of crashes, promote awareness of safety design practices and cut costs by identifying potential safety issues before projects are built. The Federal Highway Administration's Highways for LIFE team, Office of Safety, Office of Infrastructure, National Highway Institute and Resource Center have joined forces with the American Association of State Highway and Transportation Officials' Technology Implementation Group to champion RSAs. The HfL team, Office of Safety and Resource Center have created a marketing program to speed implementation of RSAs across the country. The program is designed to showcase the success of states with active RSA programs and deliver training and technical assistance to help other states and localities implement programs. Agencies have long used safety review processes, but RSAs have differences that can make them more effective. An RSA generally involves more people from more disciplines who look only at safety issues and are not involved in a project's design or implementation. This allows them to be more objective and develop a more complete report on a roadway's safety problems. The keys to a successful RSA program are top-level management support, willingness to investigate innovative solutions to safety problems, and willingness to incorporate audit findings. Although audits can be conducted any time, they are most effective when done before projects are designed and built. RSA teams, which typically have three to five members, draw participants from a variety of disciplines, including the highway safety, traffic engineering, planning, operations, geometric design, construction, maintenance, human factors and enforcement fields. Several agencies have incorporated RSAs into their roadway safety efforts. The New York State Department of Transportation has integrated RSAs into its pavement overlay program. The Iowa DOT conducts RSAs on its pavement rehabilitation, restoration and resurfacing projects. The Kansas and South Dakota DOTs use RSAs to enhance safety on existing roads. The South Carolina DOT, which conducts RSAs on projects at the development stage and on existing roads, is seeing promising results. An RSA of SC-14 in Greenville County, for example, yielded nine suggestions to improve safety, all of which were implemented. Fatalities on SC-14 dropped 60 percent from 2003 to 2004, avoiding more than $3.6 million in estimated potential economic losses. FHWA's National Highway Institute offers a two-day training course for transportation professionals on how to conduct RSAs. To register for “Road Safety Audits and Road Safety Audit Reviews” (FHWA-NHI-380069), visit www.nhi.fhwa.dot.gov. An “RSA for Locals” workshop introduces local road agency professionals to RSA concepts. To learn more, contact Eloisa Raynault at (202) 366-3499 or eloisa.raynault@dot.gov. A number of states use rumble strips as a cost-effective way to reduce crashes. FHWA's RSA Peer-to-Peer Program helps agencies get answers to technical questions on conducting audits. An agency may request assistance by e-mailing safetyP2P@dot.gov or calling (866) P2P-FHWA. The P2P coordinator will match the agency with a transportation professional who can offer onsite or over-the-phone advice. RSA resources are available at safety.fhwa.dot.gov/rsa/resources, including how-to tips, articles, case studies and information on legal issues. For more information on RSAs, visit safety.fhwa.dot.gov/rsa. For technical assistance, contact Craig Allred at the Resource Center at (720) 963-3236 or craig.allred@dot.gov. The Federal Highway Administration has awarded five grants under the Highways for LIFE Technology Partnerships Program to accelerate adoption of innovations to reduce congestion and enhance highway quality and safety. See www.fhwa.dot.gov/hfl for details. Rumble strips, those grooved patterns on the roadway shoulder or centerline that warn drivers that they've strayed from the driving lane, are proving to be a simple, cost-effective way to reduce crashes, injuries and fatalities. A study of the safety effectiveness of shoulder rumble strips on two-lane rural highways in Minnesota found a 13 percent reduction in single-vehicle run-off-road crashes and an 18 percent decline in similar crashes producing injuries. In the first six years after the Delaware Department of Transportation installed centerline rumble strips on US Route 301-a two-lane rural highway-the head-on collision rate decreased 90 percent and fatalities dropped to zero. This dramatic safety improvement was achieved even with a 30 percent increase in traffic. Despite these and other rumble strip success stories, crash statistics show there's still room for improvement. Run-off-road crashes cause about a third of all traffic fatalities, and two-thirds of those crashes occur in rural areas. Many factors contribute to roadway departure crashes, including driver fatigue or inattention and poor visibility because of darkness or inclement weather. Rumble strips provide an audible warning in the form of a rumbling sound and a physical vibration to alert drivers that they're about to drive off the road. Inexpensive to install (about 30 cents per linear foot) and requiring little maintenance, rumble strips can be used on new or existing pavements. The most common type is the continuous shoulder rumble strip, used on the road shoulder to prevent roadway departure crashes on expressways, interstates and two-lane rural roads. Centerline rumble strips are used on some two-lane rural highways to prevent head-on collisions. Transverse rumble strips are installed on approaches to intersections, toll plazas and work zones. Rumble strips are not applicable everywhere. For more information and guidelines on their use, visit safety.fhwa.dot.gov/roadway_dept/. States are taking a new look at two-lift concrete paving, a popular technique used in Europe to construct long-life pavements that use economical materials and have improved safety and pavement surface characteristics. Two-lift paving involves placing two wet-on-wet layers of concrete rather than the traditional method of using a single, homogeneous layer of concrete. The top lift is placed before the bottom lift dries. The thick bottom layer consists of lower-quality aggregate, in many cases recycled asphalt or recycled concrete aggregate. The thin top layer is made with high-quality aggregate. Crews place the upper course on the lower course in a two-lift concrete paving operation in Austria. The resulting pavement provides superior resistance to freeze-thaw damage, reduced noise and improved skid resistance. By using recycled materials, two-lift paving minimizes the need for new aggregate and cuts down on material and energy costs and landfill waste. It also reduces the truck traffic required to haul new aggregate to the construction site. The Federal Highway Administration is encouraging use of two-lift construction through its Pavement Technology and Highways for LIFE programs. Not only does the practice help meet the Highways for LIFE goals of improving safety and highway quality, its use of recycled materials reduces highway congestion during construction. Although uncommon today, two-lift construction is not new to the U.S. highway community. In the past, many states used it in constructing wire mesh-reinforced pavements. In recent decades, a couple of states have experimented with two-lift construction to promote recycling and enhance the surface characteristics of pavements. Interest in two-lift paving revived when a team of U.S. pavement experts visited Europe in 2006 for an international scanning study on long-life concrete pavements. The scan team observed two-lift paving in Austria, Belgium, Germany and the Netherlands, where the technique is used to build concrete pavements with good friction and noise characteristics, economize on the use of aggregates and use reclaimed paving materials. One of the scan team recommendations was that U.S. highway agencies try two-lift paving. “Because the technology uses marginal and recycled materials in the lower lift, it can be cost effective as well as environmentally friendly,” said Suneel Vanikar, FHWA Concrete Team leader and scan team co-chair. In addition to providing Highways for LIFE funding for projects that use innovations such as two-lift paving, FHWA is developing demonstration projects to encourage states to use the technology. A number of states are considering using two-lift paving on upcoming projects, including Florida, Georgia, Kansas and Washington. “We've done a lot of investigation on this technology. Now it's time for states to try it,” Vanikar said. FHWA and Iowa State University held a June 2007 videoconference on two-lift paving, including presentations on its use in the United States and Europe. For a DVD, e-mail the Highways for LIFE office at HfLT@fhwa.dot.gov. Long-Life Concrete Pavements in Europe and Canada (FHWA-PL-07-027), a report on the scanning study sponsored by FHWA, the American Association of State Highway and Transportation Officials and the National Cooperative Highway Research Program, is available at international.fhwa.dot.gov/pubs/pl07027/index.cfm. It includes the scan team's observations and recommendations on two-lift paving. For resources on two-lift concrete construction, including technical documents and training materials, visit the National Concrete Pavement Technology Center website at www.cptechcenter.org/projects/two-lift-paving/index.cfm. For more information, contact Suneel Vanikar at (202) 366-0120 or suneel.vanikar@dot.gov. April through June 2008 is the next opportunity for states to apply for project funding under Highways for LIFE, the Federal Highway Administration's program to advance widespread implementation of innovations in the highway community. Under the HfL program, FHWA may fund up to 15 projects a year that use innovative design or construction approaches to cut construction congestion while enhancing safety, quality and user satisfaction. So far, FHWA has awarded grants to 15 states for projects that include such innovations as prefabricated pavement slabs and bridges, full road closures, traffic maintenance technologies and contractor incentives. FHWA added the spring 2008 solicitation period to encourage more states to apply for HfL funding. “We want to provide states with as much opportunity to participate in the program as possible,” said HfL Program Coordinator Mary Huie. To qualify for HfL incentive funding, projects must use innovations that are readily available but that the state department of transportation has never or rarely used. Even if the innovation or technology has been used in other states, if it's new to the state applying for HfL funding, the project is eligible for consideration, said Huie. Project applications also must specify performance goals that define results in safety, construction congestion, quality and user satisfaction. It's not necessary for one innovation to meet all goals, Huie said. Instead, projects may combine various innovations to meet the program criteria. Huie encourages state DOT applicants to get input from throughout the highway organization to broaden the scope of innovations considered. “Don't limit yourself to just the safety area, for example,” she said. State DOTs with a project already under construction that want to add innovations that meet the HfL program criteria may also submit an application for funding. In addition, states that have already received HfL funds may submit another application if they choose a waive match instead of a grant. Under this option, the state may request an increase in the federal share of funding on the project from other Federal-aid funds. Instead of submitting applications through the Grants.gov website, agencies should send them to the FHWA division office in their state. The division will forward the application, along with a recommendation, to the HfL office for consideration. For information on applying for HfL funding, go to www.fhwa.dot.gov/hfl and click on the "Projects” tab. Among the resources available are the HfL project application, selection criteria and frequently asked questions about the program. FHWA also offers a “Seeking the Best Solutions” workshop to state DOTs in which participants learn about using innovations, setting project performance goals and preparing HfL applications. Before contacting the HfL team to schedule a workshop, a state should have a project in mind for potential HfL funding. After spring 2008, the next HfL project solicitation period is scheduled for winter 2008 through spring 2009. The HfL program is funded through fiscal year 2009 under the Safe, Accountable, Flexible, Efficient Transportation Equity Act: A Legacy for Users (SAFETEA-LU). For more information, contact Mary Huie at (202) 366-3039 or mary.huie@dot.gov. Look for the Highways for LIFE booth-#2104-at the Transportation Research Board Annual Meeting, Jan. 13-17, 2008, in Washington, D.C. View our interactive exhibit and visit with the HfL team to learn how innovation is transforming the way U.S. highways are built.